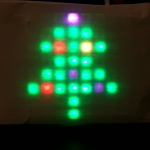 Cheerlights is a IoT based light control system, originally intended to allow social media to dictate the colour of festive lights around the world. Put the word Cheerlight and a colour in a tweet and you’ve just told light systems around the world the colour they should show. On the website is a list of the currently supported colours. On the back-end there is a feed aggregator which exposes a JSON, TXT or XML API. My plan was to use the Pimoroni Unicorn HAT to display the most recent 64 colours from the “Full” feed. Unfortunately I first started playing with this during my lunch hour at work….. where I didn’t have a Pi. So I wrote a console app in Python to read the JSON, output all the available colours, and then poll the “Last” feed for updates. I wrote some code without the Unicorn HAT to hand then tested it when I got home (there weren’t too many bugs!). Rather than using the UnicornHAT Python module I chose to use the underlying ws2812 module. Madness you say? But no! The Unicorn HAT is just a matrix of NeoPixles which means any ws2812 device should “just work”. 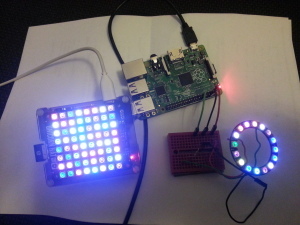 Up until now I could only control my 16 pixel NeoPixel from the Pi using a micro controller (read Arduino clone) as an interface. So I wired it up; the data line goes to GPIO18 (via a low value resistor to reduce risk of power spikes) and +ve to 3.3v, otherwise we’ll blow up the Pi! It worked as advertised first time – bonus. up to 64. So as the new colour is added the pattern shifts down in a “snake” like way. The colours are translated to RGB values via a dictionary of the supported Cheerlight colours. This section is UnicornHAT specific as the Python module allows you to treat the pixels as a grid, which makes it easier to draw patterns. It’s Christmas, and Cheerlights was devised for the festive season, so a tree is the obvious choice. 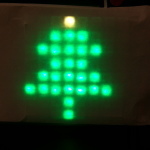 The tree patten is defined by as a list of pixel co-ordinates. The above pictures have some white paper over the pixels to diffuse the light which gives a nice effect. Well, that’s that. 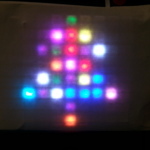 I hope a few of you reading this have a play with the code, be it with generic NeoPixels or a Unicorn. Let me know how you get on in the comments below. 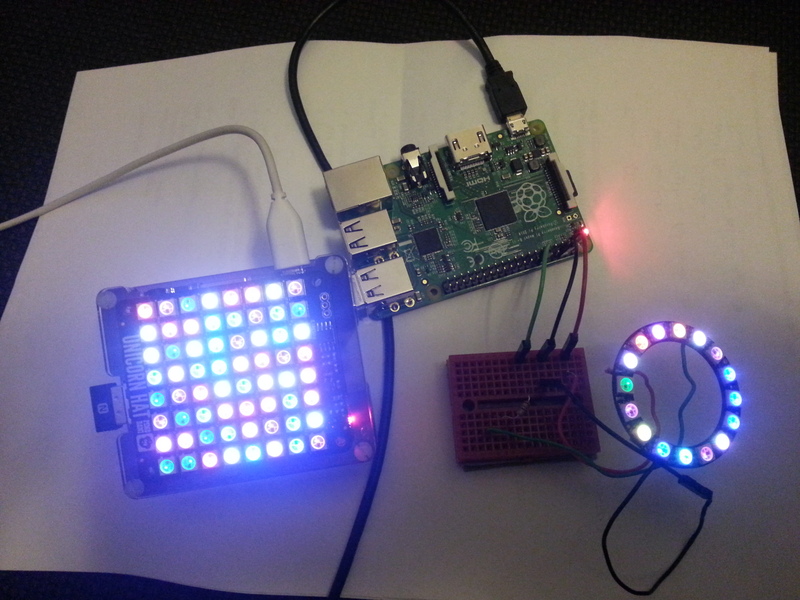 This entry was posted in Add-On, IoT, NeoPixel, Raspberry Pi on December 13, 2014 by ForToffee.